Hi all! 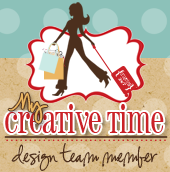 Welcome to day three of the My Creative Time Sneak Peeks! Are you ready for some more sneak peeks??? Im having way too much fun with this stamp set that I went a little out of my norm. I actually used fun colors and not my old or vintage style. My daughter recently watched the movie "Judy Moody" and asked me if we could come up with a list of things to do during the summer. I thought it would be cute if we could make a scrapbook of our summer days in one book. Well, we got started a little early since she was so excited about this project. I used Emma's stamps through out this Smash journal and I think they went perfect with our summer theme! I sprayed glimmer mist on the front of the journal and added the glasses die from What's Growing On set. I also stamped flowers from the Bloom Where You are Planted and colored them with my Tim Holt distress markers. Today we are featuring these cute little pockets from the Fun Pockets Stamp set. I am so in love with these cute little pockets! This is such a great summer project for the kids. I love that we could use MCT stamps and dies for the whole book. I used up a lot of my paper scraps left over from other projects and packaging from things I buy (Did you notice the Prima flower and EK success packaging?Oh and a few misspelled words? LOL) This is also a great way to get your scrapbook pages done without having to fill up a whole 12 by 12 layout! And there are no rules and no mistakes! Ok make sure you go get your stamps now because the sale ends May 18th! Thanks for stopping by!! Hugs! Awesome Smash Book! All of Emma's products make such great elements in it!!! Wow! I LOVE your Smash book! I have to admit, I don't have any of these products, but I'm thinking I need some! You made this book look fabulous! What an awesome idea and such super adorable pictures! Great use of the new release!!! Nancy ~ where do I begin with this WHOLE CONCEPT! I LOVE all the details you added ALREADY but the best is you are DOING it together! What a fun idea and cherish moments together! FABULOUS idea! I might have to do this with Ryan ~ even thought he is only 6 but something fun to do together! Thanks for the idea! How cute!! I am working on a scrapbook of stories that my daughter has written (she is just 4 so I am typing up the stories until she can write them herself) how cute for your kids to look back when they are older at all these pictures and stuff they have done!! Awesome job on oyur scrapbook!Love all the details and it looked so much fun!!! I like that you used the great paper from packaging...it looks great. What a wonderful idea for a scrap journal! Your pages are designed beautifully! Love your idea for a summer project. I think my step niece would love this. Emma's stamps will be great addition to the pages. Thanks for sharing your book. Great idea for a journal with all the extras. I love your smashing pages, thanks for sharing. Awesome idea - my 9 year old daughter just started her Smash book for the Summer too! What a fun smash book! Love the hearts coming out the of pocket die being featured today! TFS! Great idea for a summer project. What a neat idea, this book is fabulous! TFS Nancy and I hope you have a lovely day! You have given me some GREAT Smash ideas. Love it! Thanks for sharing. How neat!! What an awesome memento!! !